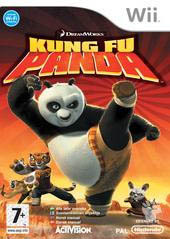 Kung Fu Panda is the latest computer generated movie from Dreamworks that revolves around an overweight Panda who is destined to become the Dragon warrior. The game is based loosely on the motion picture of the same name with key elements of the story to assist in the storytelling of “Po”, the Panda who dreams of a better life. o Master Po’s signature “Panda Style” maneuvers, including the Panda Quake, Panda Stumble and Iron Belly Blast. Plus earn awesome Kung Fu upgrades increasing Po’s strength, speed and agility, as he progresses from the unlikely hero to the powerful Dragon Warrior. o Play as Po’s teacher, Shifu, the quick, agile and impressively skilled Kung Fu master. Players make use of Shifu’s wisdom and speed to perfect his whirlwind techniques. o Take control of the daring Tigress, and utilize her fluid and powerful moves focusing on fast, stylized combat that allows gamers to master the Leaping Force and Tiger Charge maneuvers. o Monkey’s spring-loaded tail attacks and explosive style make him one of the fastest Kung Fu masters around. His acrobatic abilities will let players execute a variety of lightening-fast platforming moves. o Viper’s snake-like stealth abilities allow gamers to utilize her stealth abilities to pull off such moves as the Umbrella, Enemy Taxi and Choking Coil attacks. o Players will soar with Crane’s Surface-to-Air Attacks using his graceful and light footed movements, which allow them to Fly, Glide and Swoop. o Although the smallest of the Furious Five, Mantis’ super strength, strong grab maneuvers and super quick burst moves will allow players to deliver powerful and paralyzing strikes to foes. 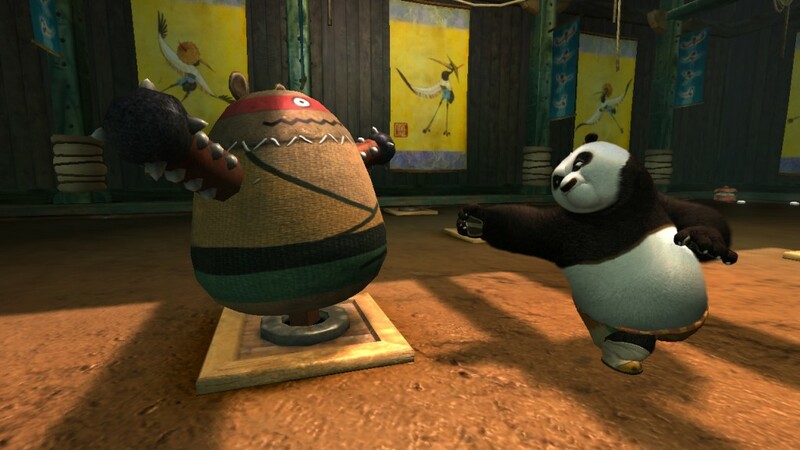 In its essence, Kung Fu Panda is an arcade game that has the player controlling Po as he fights his way to victory, generally in many humourous ways. Match that with a simplistic combat system that allows our Kung Fu Panda to perform a variety of attacks and this game is definitely one for the younger gamer who enjoyed the movie. The control system of Kung Fu Panda on the Wii suits the control system perfectly with all buttons neatly mapped on both controllers. One controller is used to navigate Po and control the camera angles, whereas the other controller is used to interact with the gaming environment and engage your foes. Although Po can use his fists and feet to perform some lethal martial art maneuvers, he also has access to weapons and other items that can be thrown at your opponents which makes for some interesting gameplay. This large panda can also climb trees and sometimes with a fluid like grace which is quite entertaining and is reminiscent of the movie itself. Ironically, Po can even perform some Sonic the Hedgehog style of maneuvers as he rolls around the gaming environment collecting gold coins and other assortments which is strangely odd, considering his size. Although the game is an arcade action game, the main story mode is sometimes confusing as the mission objectives are not clearly displayed to the gamer, however persistence does pay off. The only issue I had with the control system is that the camera angles sometimes becomes blocked by objects and you need to manually change the view which does become a little frustrating when you are engaged in fighting. 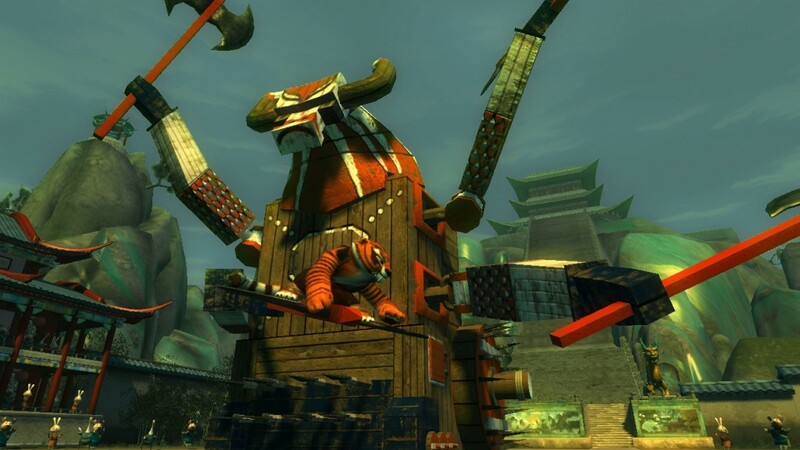 The boss battles in Kung Fu Panda are varied and entertaining with the character having access to a slow motion “mode” that assists in battling your enemies and is once again reminiscent of the movie as there were quite a few slow motion scenes in the movie. Although Po is primary your main character, you can control some of the other characters in the game such as Tigress which does assist in sprucing up the gameplay. 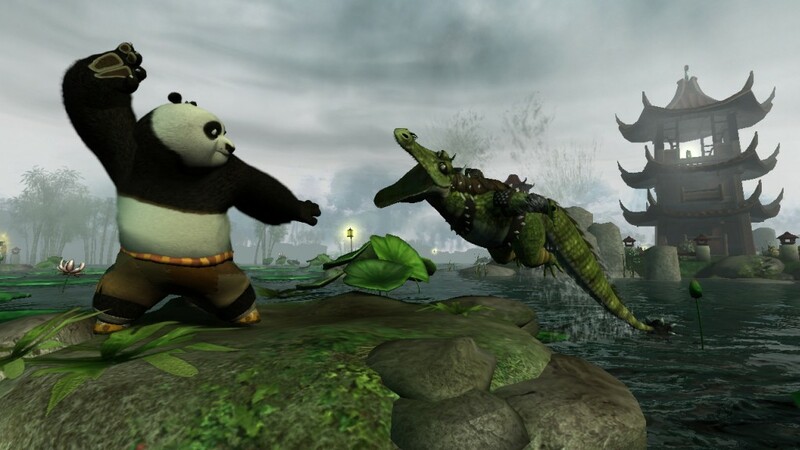 The multiplayer aspect of Kung Fu Panda is rather entertaining as you can fight other players and also contains some interesting memory games that will hold the attention and imagination of younger gamers. Graphically, the title uses a variety of scenes and characters from the movie with some of the environments almost duplicated in the game. The title has this Saturday morning cartoon feel to it with colourful characters and rather detailed and engaging background environments. Match that with some colourful special effects and some great cutscenes and Kung Fu Panda is a rather competent game. The voice acting of the game is quite professional and does sound like their movie counterparts as does the ambient soundtrack. In conclusion, Kung Fu Panda is a great game for the younger gamer with a great storyline, good graphics and a very good control system. The only downside to the game is the sometimes unclear mission objectives but it will give the player value for money.